It is really nice as a parent when you purchase a toy, and it ends up blowing away your expectations. That would be the case with the Walmart brand pull back monster truck set we bought for our son. I believe we bought these as a gift for some major accomplishment that now seems sort of minor in retrospect, but hey, any excuse to buy new toys is a good excuse in my book. I had low expectations for this monster truck toy set since it was inexpensive, and just a generic Walmart toy brand – but I have been impressed by the durability and the overall enjoyment my son and I have gotten from playing with them. 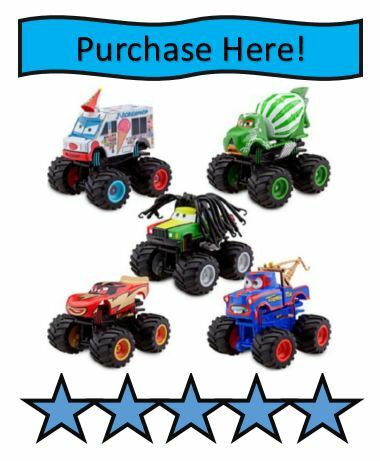 These toy monster trucks exceeded my expectations, and as long as you aren’t expecting the world out of them, they are a nice gift option for kids! These Disney Monster Truck Toys are Awesome! There are about a million different types of toy monster trucks you can buy. I can’t review all of those, but I can at least share our experience with the version we bought. 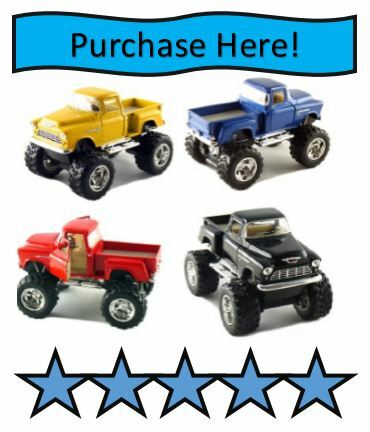 If you are looking for something a little different, you won’t have any problem find a monster truck toy that meets your expectations at pretty much any toy store. The Walmart pull back toy monster trucks we bought came in a set of two trucks, with two spare tops (4 tops total). The tops of the trucks lock into place, but can be swapped out with the spares included with the set. This is slightly difficult to do, so expect your two or three year old to ask for assistance doing this. The swappable tops came in yellow, white, red, and black. My son likes to rotate between all four colors, and I personally find the yellow one as the best looking. When you pull back – then push the toys forward, they will move on their own with pretty good speed. It may take a little bit of time to teach your child the best pull back techniques, but they will get the hang of it pretty quickly. One slight draw back to this option is just pushing the truck forward won’t get them moving well at all. They also work best on low carpet, tile, or laminate style flooring. A shag carpet would be a real challenge for these (and most pull back toys). My son will build ramps out of books and blocks (maybe with a little parental help) and they maneuver over these pretty well. He will also crash them into things and have them drive over other cars. They have been surprisingly durable for their cheap price. They won’t survive a toddler jumping up and down on them, but will handle all the rough and tumble normal play a toy car goes through. The biggest challenge will be just teaching how to pull the toy back and use it properly. We didn’t have our first piece breakage until about 4 months of use, the plastic part that connects the top to truck base broke off – not bad for under $10 bucks. I would recommend your child be at least 2, possibly 3, for this toy monster truck version depending on how well they play with toys, and fine motor skills. There isn’t anything here to be overly concerned about. There are a couple of small plastic pieces that could become choking hazards if they are broken off the toy. Just make sure your toy isn’t broken and this won’t be a concern. Toys being thrown are always a concern, but they aren’t heavy enough to cause problems. We have had no injuries with these toys, which is really good for our household! Since they are larger than a match box car, slipping on them isn’t much of a concern either. This particular set of monster truck toys scores a 2 out of 10 on our danger scale. There isn’t too many things that are going to annoy you here. It takes a little bit to learn how to swap the different tops on the monster trucks, and since your child might have difficulty doing this they might bug you to change colors over and over again. You will have to teach them how to use the trucks properly, but this set doesn’t make annoying sounds that will irritate you. For these reasons, we give it a 2 out of 10 on the annoyance scale. There are so many good monster truck toys to pick from. This set is perfect for incorporating them into your toy car collection. The pullback action makes them easy to use, and the price is fantastic. 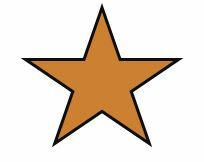 I do give them a bronze star rating – borderline silver star rating – mostly because they just aren’t that memorable. I don’t expect these toys to become an all-time favorite for most children, but for kids that love transportation toys, I would recommend incorporating these into the rotation!